Mjollnircoin (MNR) is a HEFTY1-based crypto coin that is using the same algorithm like Heavycoin, though there is no reward voting support with MNR, so you will need a slightly modified miner in order to mine it even though the algorithm is the same as for HVC. We already have a ccminer update to support MNR for Nvidia GPUs and there is also a cgminer 3.7.3 with Mjollnircoin support available for AMD OpenCL mining (source). Do note that Nvidia is still faster in mining HEFTY1-based crypto coins such as Mjollnircoin (MNR). 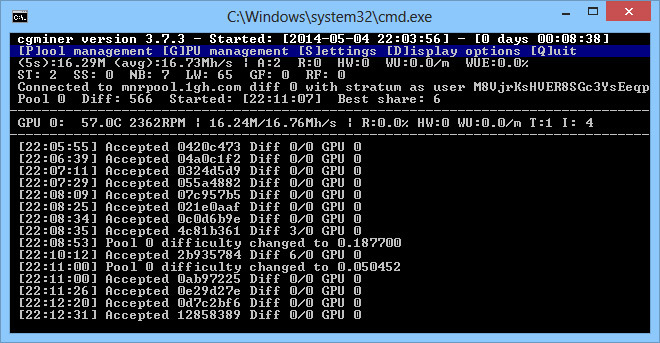 With the cgminer for MNR mining we are getting a bit over 16 MHS mining on a single Radeon R9 280X video card.